The Old Stables is rather special. A superbly renovated 18th C stone stable with many original features, set in its own private walled courtyard, within the historic Cowbridge conservation area but adjacent to the open countryside. 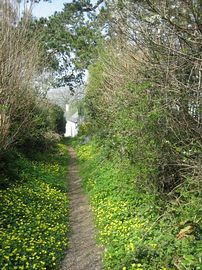 Turn up the lane from the courtyard gates and after a walk through the glorious countryside have lunch or a drink in the Bush Inn, in the historic village of St Hilary. Turn down the lane and walk to the centre of Cowbridge in 5 minutes, sample its exquisite shopping experience or fine restaurants or pubs. 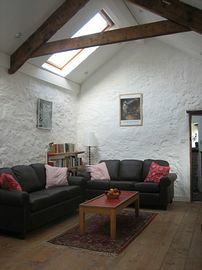 The spectacular living room with its limewashed walls, high ridged ceiling and its mellow original timberwork has two huge west facing rooflights, which flood the room with natural light, making it a real risk that you may spend your holiday in here reading. Whilst the room's height gives it a feeling of spaciousness, its modern insulation and heating system keep it warm even in the coldest weather. In warm weather, with the large stable door open, the thick stone walls provide a cool haven within, which integrates seamlessly with the sunny courtyard with its own lockable gates from Coxen Lane, giving secure parking. The kitchen has been carefully designed to fit within the stable's original hay store and still retains many original features. In addition it now has a large rooflight, a fan oven, 4 gas rings, fridge-freezer, washing machine and dishwasher. 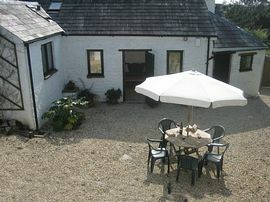 The stables original stone steps now lead up to the bathroom and bedrooms. 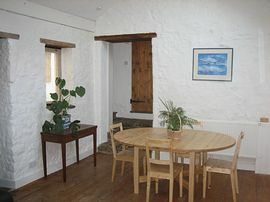 The charming main bedroom, with its timber ridged ceiling and handmade door, overlook the courtyard. The double bed is flanked on either side by fitted wardrobes, creating an intimate space. The fully equipped bathroom has a Grohe thermostatic shower above the bath, the ceiling above incorporating a skylight, which in addition to flooding the area with natural light, is superbly efficient at removing steam. 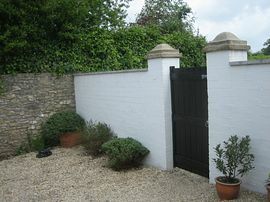 Very sunny , private, walled courtyard with lockable gates for secure parking. Spectacular main room flooded with natural light throughout the day. M4 Junction 33, A 4232 to Culverhouse Cross, Then A48 to Cowbridge.